So much for using foraged sticks, there are now many options for ski poles as well. 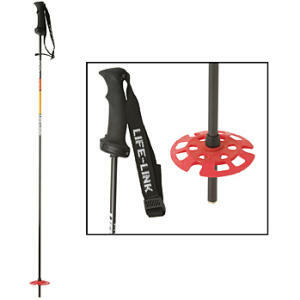 It can be convenient to make an adjustable pole longer for ascents and flat terrain, then shorter for descents. However, remember that each point of adjustment adds both weight and a possible failure mode. Black Diamond FlickLock poles are a widely used option. They are compatible with the popular Whippet self-arrest grip. Another option that works with Whippets are BD’s Carbon Fiber FlickLock poles. Life-Link offers The Claw as another self-arrest grip option at less than half the price of a whippet. The Claw is compatible with Life-Link’s Variant, Guide Ultra Light, Avalanche Lily, and Carbon Pro and Race poles. 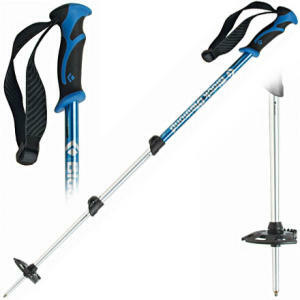 Several raves about the Indigo Epic ski poles are easy to find on the web. Many of these poles double as avalanche probes. The Grivel Condor is a retractable self-arrest grip that is compatible with any ski pole. 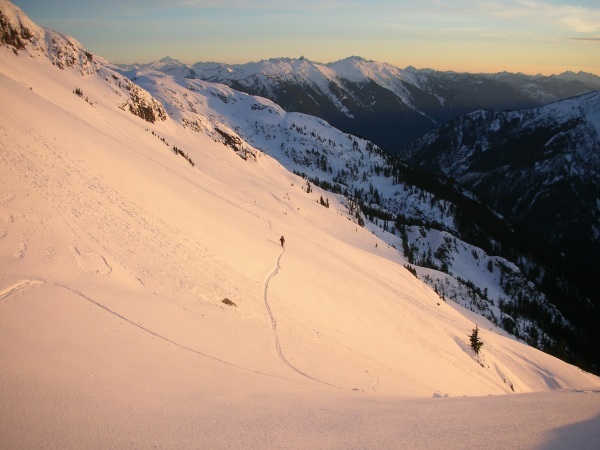 Jason Hummel skins toward the Southern Picket Range bathed in a beautiful January sunset. Poles with narrow tips get much better purchase on ice. It can be disconcerting to have your pole slip and offer no support as you make a step. This is an advantage of fancy, expensive poles but mechanically inclined dirtbag skiers could grind the tip of any old pole to a sharp point. 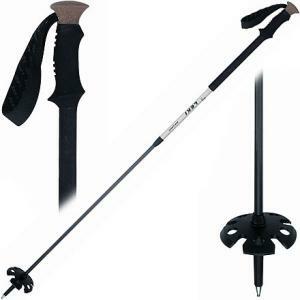 With so many options for something as simple as a ski pole, don’t be overwhelmed. Note that probe poles are a very weak alternative to a true avy probe, but still better than nothing. Also, while they are highly useful, remember that arrest grips are best used for climbing and skinning and will never replace an ice ax. If you’re skiing with the use of an arrest grip in mind, you might put yourself in a disadvantageous back-seat position. Personally, I’ve been skiing for the last two years with nothing but old fixed-length aluminum poles that have leashless grips. Free is a very good price. Buy Poles and Skins Now! Black Diamond FlickLock On sale! Black Diamond Ascension STS On sale! Between freeing the heel and climbing a hill come the climbing skins. 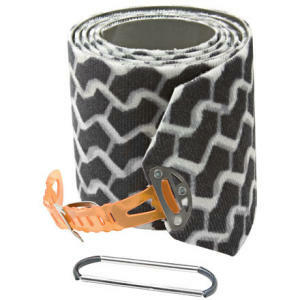 These climbing aids have an adhesive on one side that sticks to the bottom of the skis, while the other side has a fabric with a rear-oriented nap that provides great resistance to backsliding and minimal friction for gliding forward. They’re called skins because they were first made from the skin of seals. Before the militant Seattle vegans create an uproar: Now they’re made from nylon. There are two schools of thought regarding skin sizing. One school values wall-to-wall coverage for maximum traction on steep slopes. Another train of thought worries about getting derailed on icy slopes; sometimes it helps to have the edges exposed. One guideline is to buy the narrowest skins that are wider than the ski’s waist. Skins bought with this specification require trimming before use. 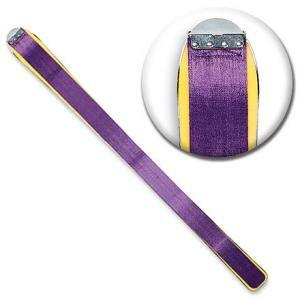 One technique is to get the skin attached to the tip and tail of the ski, then just cut it along the ski’s edges (A trimmer comes with the skins. I have four of them. Please take on off my hands if you want.). Skins also come with documentation to provide a much more involved, rewarding skin-trimming procedure; enjoy. Black Diamond now offers pre-trimmed skins for lazy folks. Ski shops will usually trim skins with purchase. G3 skins have worked well for me. My perception has been that they don’t climb as well as Black Diamond skins, but they glide better. Contrasting opinions certainly exist. While the glue does not have nearly as good of a reputation as BD’s, the tail attachment is bomber. But now that’s no longer an advantage, since Black Diamond began making the STS attachments. Black Diamond bought Ascension Skins several years ago and it’s essentially accepted as doctrine that they have the best glue. I don’t recommend Black Diamond’s ClipFix system. If you want the skin secured to the tail with Black Diamond skins, then get the STS. If you’re brave, go with nothing. Or, made specifically to be lighter, offer more glide, and attach to several pairs of skis, try Black Diamond’s Kicker Skins. 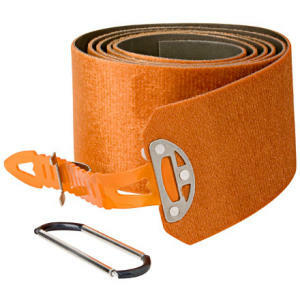 Backcountry Access makes LowFat climbing skins, which are quite light.